Microsoft is not an ordinary company. Apparently it is trying to get special treatment from governments by colluding with the oppressive, increasingly-globalised police state (NSA) and selling people out. Recently, Microsoft used an occupied Nokia to attack Android not just with patents but also with antitrust complaints. links about Nokia’s state after Microsoft occupation). Aha! Microsoft. So, it’s about *Microsoft’s* business model, not any other FairSearch member? Well, maybe Microsoft’s little partner, Nokia, but that is the same thing, having trouble competing against Android, and complaining to regulators that it’s not fair to distribute Android for free when others have proprietary products that they claim they have to charge for to recoup their investment. That makes this complaint yet another anti-Linux, anti-Open Source, anti-GPL attack from Microsoft, which has a long history of such behavior. It’s an attack against the Open Source development model itself. Free distribution is the norm for Open Source. It’s also, I believe, part of a coordinated smear campaign against Google. And while FairSearch claims it’s not dominated by Microsoft, this complaint demonstrates otherwise. Florian Mueller, Microsoft’s paid consultant, weighed in on this last Friday. He seems to feel that Microsoft has suffered some kind of injustice. Unlike Florian, I have litigated at the ITC; although I’m no expert, I do have some familiarity with the process. I can’t agree with his take. First, some background. At the ITC, Microsoft accused Motorola of infringing 7 patents based on the calendar syncing in some of its Android phones. Microsoft lost on all but one of the patents. But Motorola’s smartphones were held to infringe one patent, U.S. Patent No. 6,370,566, which the Commission found was not invalid. A competitive strategist at Microsoft has told cloudy partners that competing with Google on price is proving to be commercial suicide, particularly in industries where firms are under financial constraint. The confession was made at a breakout session at the Worldwide Partner Conference, which Microsoft plainly didn’t intend to go any further judging by the “private and confidential” wording heading the webcast. As Will Hill put it: “Translation: Lie and Bribe. But while Linux in general may still lack some features available in modern versions of Windows, and vice versa, drawing comparisons between the two operating systems is much more difficult today than it was a decade or two ago. 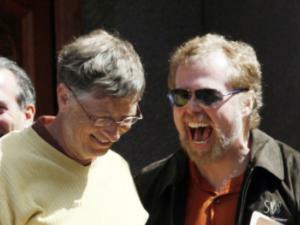 The relationship between Microsoft and Linux has shifted fundamentally since then. Redmond is no longer so deeply at odds with the open source community. Microsoft’s ‘gentle’ side and the thuggish side. The New York Times went after another big patent troll yesterday, the second in less than a week link here. This one is called Intellectual Ventures. It seems to be a spinoff from Microsoft, a major patent holder, as it is run by Microsoft’s former chief technology officer, Nathan Myhrvold. Its origin may raise the question as to how much business it does with Microsoft and whether it profits in some way from the new enterprise. A study out of Stanford says the term “patent troll” may have come from the Norwegian folk tale, “Three Billy Goats Gruff.” Researchers claimed it was coined, ironically, by a co-founder of the country’s biggest PAE — Intellectual Ventures. A troll makes three billy goats pay a price to cross a bridge. Adorable. But less adorable, and more exciting, is the version of trolls in “The Lord of the Rings,” where trolls try to eat their nemeses, so let’s go with that. Teachers are important, and of course we want to recruit the most expert and brightest possible, and give them lots of support. But the expansion of tests, and efforts to make teacher jobs depend on ever-rising scores, are turning our schools into test preparation factories. Hanushek’s ideas have been driving a vast school reform project, which has been underwritten by the largest philanthropies on earth—starting with the Gates and Walton foundations. Now that this project is a decade old, and showing little signs of success, the time has come for a major reappraisal. Rather than vesting our trust in tests to identify and weed out the worst teachers, why not invest some confidence in these teachers themselves, and empower them to engage in peer observation and growth through proven programs like Peer Assistance and Review? These programs feature experienced teacher coaches working with peers who have been identified as struggling. This has been found to be an effective way to strengthen teachers—and remove those who are unable to improve. Opportunists love monopolies. Government services are monopolies, but can Gates privatise these to ‘own’ for profit a system fed by taxpayers? He sure made progress by bribing much of the press. The same is done to promote patent trolling. Microsoft co-founder and American billionaire, Paul Allen, will appear before a Botswana court in October for allegedly attempting to smuggle giraffe bones from the country to the United States of America. According to the King County Superior Court, a safari guide was arrested and detained in Maun, Botswana’s tourism capital, by customs officials after the Microsoft co-founder and current Seahawks owner, Allen, and his sister, Jody Allen, tried to sneak home the bones while on safari in Botswana. Court papers charge that a review of the trip to Botswana by the Allens has revealed a pattern of illegality.